Sleepwalkers was released the year I turned 18, and as I lived in a small country town where everyone knew everyone I wasn’t permitted to rent R rated films until I was 18. Of course as soon as I turned 18 I watched as many as I could, and Sleepwalkers was one of the first. Now 20 some years later I can’t even fathom why it was/is R rated. The small US town of Travis has new residents, Charles and Mary Brady. Mother Mary and son Charles are as close as two family members can be – in fact way closer than they should be as alluded to above. They are also sleepwalkers – creatures with the ability to shape-shift and change the appearance of things around them who feed on human blood. Their only weakness appears to be the common housecat, who in turn seem to instinctively sense their presence and gravitate toward their location. Their other more obvious weakness is hunger, and apparently they require the souls of virginal females to survive. They refer to these lasses as ‘nice’. Bushy eyebrowed and cute as a button, Tanya Robertson (Madchen Amick) is especially ‘nice’ (especially when I rented this as an 18 year old!) cinema attendant who Charles manages to woo in 7 minutes flat. Sleepwalkers is reasonably violent in that straightforward 90s way, and when they do aspire to appear more adventurous it gets plain silly – death by corncob anyone? But it has its moments; the acting is just as adequate as it needs to be, Amick as hot as required, and at a lean 80 minutes it sensibly doesn’t outstay its welcome. Final Rating – 6.5 / 10. 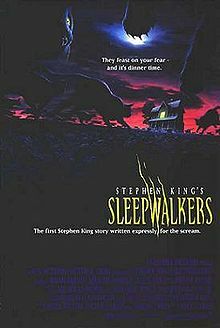 It might be hard to track down nowadays – I made do with an old VHS copy that has sat in a cupboard for over a decade – but Sleepwalkers may be a pleasant surprise for those not expecting too much.